We're coming up on our one-year anniversary of the e-Literate Big Picture: LMS market analysis service and getting our Spring 2017 report ready. One of the things that I love about working with LISTedTECH as our partners for this service is that their data goes beyond a snapshot in time and well beyond the North American market. Not to mention their skills with visualization of data. During a session today at the ASU/GSV Summit, Instructure CEO Josh Coates described how the company tests out new ideas - making bets and getting rapid feedback - and one example used was seeing if they could sell the Canvas LMS into a new country, Spain in this case. With the Spring 2017 report, our market analysis is expanding to Latin America and Oceania (Australia, New Zealand, surrounding island countries) for the first time after we added Europe in Fall 2016. The data gets more solid over time, so there is less "noise" in the US and Canadian data. We have not finished our analysis for the report, so these graphics have not been reviewed and tested as much as others. So pay attention more to broad trends than specific numbers. The subscription service is for higher education and does not include K-12 schools. With that in mind, we couldn't help but share this data publicly on e-Literate. 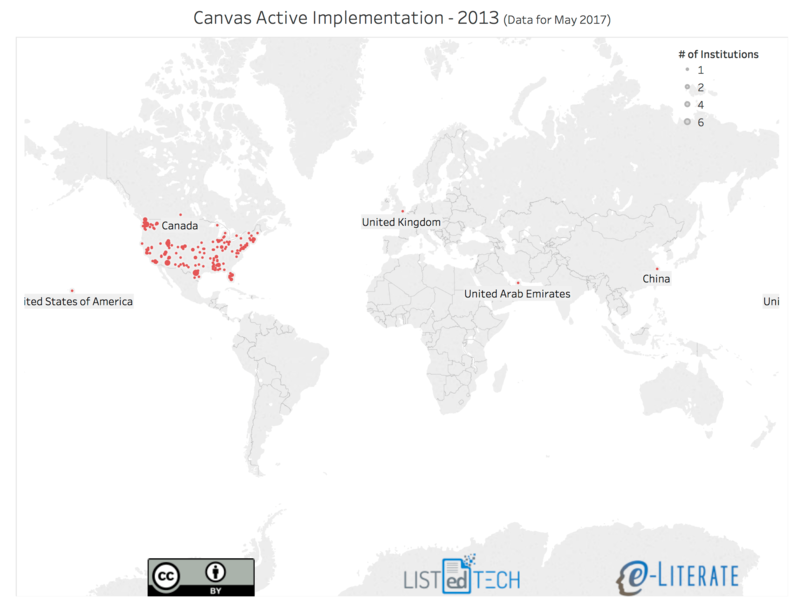 First, consider the footprint of Canvas as an LMS in 2013, a few years after the product launched. Now look at the global footprint as of May, 2017. That's quite a bit different, and the northern European countries in particular show a lot of growth. But there is also new implementations in Latin America, Oceania, and others areas. 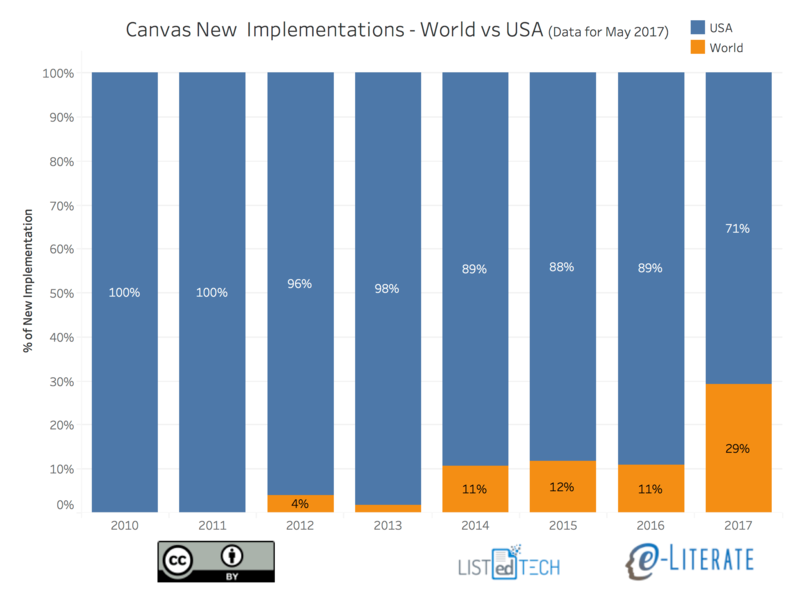 Now look at the percentage of Canvas new implementations happening in the US vs. the rest of the World ("World" in this graphic equals all other countries). Note that 2017 is partial-year data through early May. Remembering that broad trends are most important in this first-view of data, we can see a big jump in 2017 thus far for international markets for Canvas. 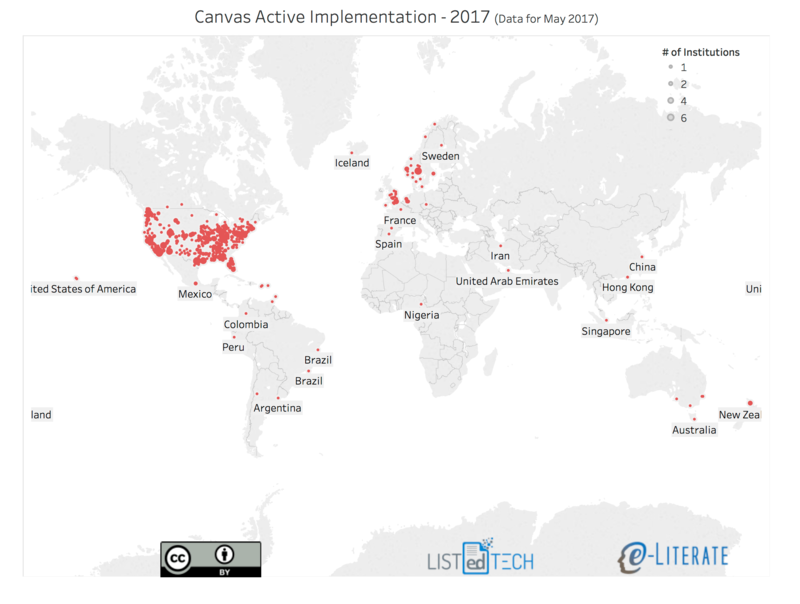 It will be interesting to update this view at the end of the year to see if the trend holds, but it is quite clear that Instructure is making Canvas a global LMS. We have already mentioned that other LMSs - most notably Moodle, but followed by Blackboard Learn and D2L Brightspace after them - have already been established as global market systems, so don't interpret this data as showing Canvas as the first. But it does show a real change in the global market that will have big impacts. For those interested in the LMS market analysis service, go to this page for details, pricing, and order form links. The same page also has a signup on the right column for those wanting more information on the service but not yet ready to subscribe. We'll have more data to share on e-Literate as well as we get the report finalized. Thanks for this information, but have you heard of Skoolee as a MIS for k-12 including its own LMS module?